Claude Debussy's talent for the piano was discovered by his first teacher, Madame Maut de Fleurville, a former student of Chopin. She sent him to the Conservatory in Paris. First he wanted to be a virtuoso pianist, but he failed and turned to composition under Ernest Guiraud. He won the Prix de Rome in 1883 with his cantate "The Prodigal Son" and lived at the Villa de Medici in Rome from 1885 until 1887. Afterwards he visited Bayreuth in 1888 and 1889. He was fascinated by Wagner's music and especially liked "Parsifal". But in later years he rejected Wagner's compositions and most other German romantic music. From 1887 onwards he almost exclusively worked as a composer and hardly appeared as a conductor or a pianist anymore. Both his orchestral works and his piano music became famous. He had many affairs with women. He had lived in relative poverty with his mistress Gabrielle Dupont since 1889 and she attempted to kill herself in 1897. It was a difficult time in his life and he himself frequently thought of suicide as well. In 1899 he married the dressmaker Rosalie Textier. He wrote a large part of his opera "Pelléas et Mélisande" in 1893-1895, but he continued to change it until it was first performed at the Opera-Comique on April 30, 1902. Critics said it was decadent and poor in melody, but it became an international succes. Debussy started several other opera projects, but none of them were completed. In 1904 he left Rosalie for Emma Bardac, the wife of a banker. They lived at the Avenue du Bois de Boulogne, where Debussy would stay until the end of his life. In 1905 they had a daughter and in 1908 they were married. Debussy suffered from cancer but he continued to work. When the First World War started he lost all interest in his music, but pulling himself together he performed his last work "Fourth Sonata for Violin and Piano" at the piano in May 1917 at St. Jean-de-Luz. He died during the German bombardment of Paris in March 1918. 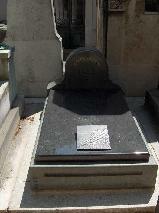 The grave of Claude Debussy at Passy Cimetière, Paris.